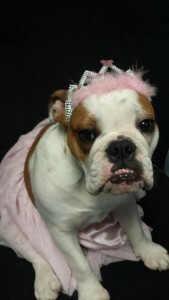 “Princess” Gracie wants your car heater to be in good repair! Hi! My name is Gracie! Everyone around here calls me Miss Gracie. I guess that’s because I’m my pet mommy’s little princess! I think I have the best pet mommy ever! She always takes such great care of me! It’s started getting cooler and that makes me shiver. My pet mommy has been talking about getting a sweater for me. I like that idea! I don’t like being cold! My pet mommy says that the weather is cool now … and that it’s going to get even cooler. She says the fall evenings are going to get cold soon! I’m so glad that the heater in pet mommy’s car works really well! Does the heater in your car work? If it doesn’t, you might want to bring your car in for my pet daddy to look at! My pet daddy and all of his mechanics are really good at fixing cars! I know they can repair your car heater! Tomorrow is Halloween! And my human siblings are getting ready for all the fun! Lots of children are getting ready for Halloween! I’ve got my costume! Everybody has been telling me how cute I look in it! The weatherman said that the weather for Halloween night is going to get cooler and that it’s supposed to rain. I just know I don’t want to be cold! I’m glad that the heater in my pet mommy’s car works great! Before it gets really cold, maybe you should make an appointment to bring your car in for my pet daddy and his mechanics to check! They will look over your car heater and make sure it works really well! And if it’s not working, they can repair it for you! They are really nice people … they give me lots of treats! Go ahead. Bring your car to my pet daddy. His mechanics won’t do any trick on your car! They will check the heater and repair it really good for you! I think that’s a real treat! You know what? I think every day must be Halloween! Because, every time I do a trick for my pet mommy (she likes when I sit real pretty for her), she gives me a treat! When you bring your car to my pet daddy, be sure and say hello to me! Maybe I’ll do a trick for you… if you have a treat for me!